Monetary policy affects aggregate demand and the level of economic activity by increasing or decreasing the availability of credit, which can be seen through decreasing or increasing interest rates. Recall that an open market purchase by the Fed adds reserves to the banking system. Banks turn those reserves into new loans, making credit available to more borrowers and increasing the supply of money. Consider the market for loanable bank funds, shown in Figure 1. The original equilibrium (E0) occurs at an interest rate of 8% and a quantity of funds loaned and borrowed of $10 billion. An open market purchase by the Fed will shift the supply of loanable funds to the right from the original supply curve (S0) to S1, leading to an equilibrium (E1) with a lower interest rate of 6% and a quantity of funds loaned of $14 billion. 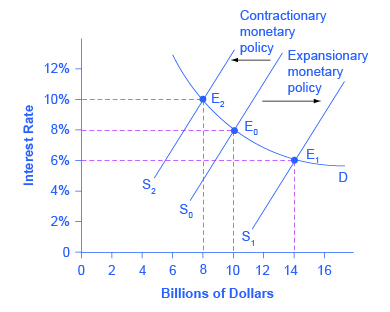 This is an example of an expansionary monetary policy. Conversely, an open market sale by the Fed reduces the amount of reserves in the banking system which requires banks to decrease their loans outstanding, reducing the availability of credit and decreasing the supply of money. This will shift the supply of loanable funds to the left from the original supply curve (S0) to S2, leading to an equilibrium (E2) with a higher interest rate of 10% and a quantity of funds loaned of $8 billion. This is an example of contractionary monetary policy. So how does a central bank “raise” interest rates? When describing the monetary policy actions taken by a central bank, it is common to hear that the central bank “raised interest rates” or “lowered interest rates.” We need to be clear about this: more precisely, through open market operations the central bank changes bank reserves in a way which affects the supply curve of loanable funds. When the Fed decides to conduct an expansionary monetary policy, they purchase Treasury securities held by private investors. When the private investors deposit their payment from the Fed, the new reserves have been injected into the banking system. As a result, interest rates change, as shown in Figure 1. If they do not meet the Fed’s target, the Fed can buy or sell Treasury securities, injecting more or less reserves into the banking system until interest rates do. Of course, financial markets display a wide range of interest rates, representing borrowers with different risk premiums and loans that are to be repaid over different periods of time. The prime rate is the interest rate banks charge their very best corporate customers, borrowers with the strongest credit ratings. If Google were to borrow money from Bank of America for a short period of time, Google would be charged Bank of America’s Prime Rate. Customers with less strong credit ratings would be charged more than the prime rate (typically thought of as Prime rate plus a premium). The prime rate is thus the floor on which a bank’s short term rates of different types are based. Additionally, variable interest rates like car loans or credit cards are often based on the prime rate. When the prime rate changes, variable interest rates will change also. Since each bank can charge its own prime rate, the published prime rate is the consensus or average rate banks charge. Longer term interest rates like mortgage rates typically are higher than shorter term rates like the federal funds rate to reflect the fact that lenders have given up the use of their funds for longer periods of time. Both the federal funds rate and the prime rate are market determined interest rates. In other words, they are determined through the interaction between supply and demand in their respective credit markets. In general, when the federal funds rate drops substantially, other interest rates drop, too, and when the federal funds rate rises, other interest rates rise. However, a fall or rise of one percentage point in the federal funds rate—which remember is for borrowing overnight—will typically have an effect of less than one percentage point on a 30-year loan to purchase a house or a three-year loan to purchase a car. Monetary policy can push the entire spectrum of interest rates higher or lower, but the specific interest rates are set by the forces of supply and demand in those specific markets for lending and borrowing. In finance, people differentiate between money markets and capital markets. Capital markets refer to the markets for long term financial assets: e.g. notes, bonds, and equities. Money markets refer to the market for short term financial assets, like bank accounts, small denomination time deposits (e.g. Certificates of Deposit) and bills. Thus far, we have explained how monetary policy is implemented and used the market for loanable funds to illustrate this idea. The market for loanable funds is a broad view of financial markets, including equities, bonds, bank accounts and all other financial assets, something like money markets and capital markets combined. We can also analyze monetary policy by looking only at the money market, which we’ll do in the following video. The money market is a subset of financial markets generally, but it is useful to examine how monetary policy plays out in the money market because that is where monetary policy is focused; it’s only after monetary policy impacts money markets that it spills over more broadly into other financial markets. As you watch the video, think about how this is similar to and different from the loanable funds market analysis we presented above. The main difference is that the money supply curve is vertical since the Fed can fix the supply of bank reserves and thus set the money supply at any level it wishes, independent of the interest rate. The outcomes of the money market analysis and the market for loanable funds are the same—this is just an equivalent way to think about monetary policy. Watch this video to better understand how the Fed can alter interest rates. You’ll see how adjustments to either the reserve requirement, discount rate, or open market operations can lead to either expansionary or contractionary fiscal policy.